Hey guys! We’re down in Dallas this week for Lightovation 2019! We’ve had the chance to check out some amazing new products and fixtures for our lines and can’t wait to share them with you. We’ve been posting some of our favourites in our Instagram stories, so you can check those out now, and we’ve got a blog post coming soon! 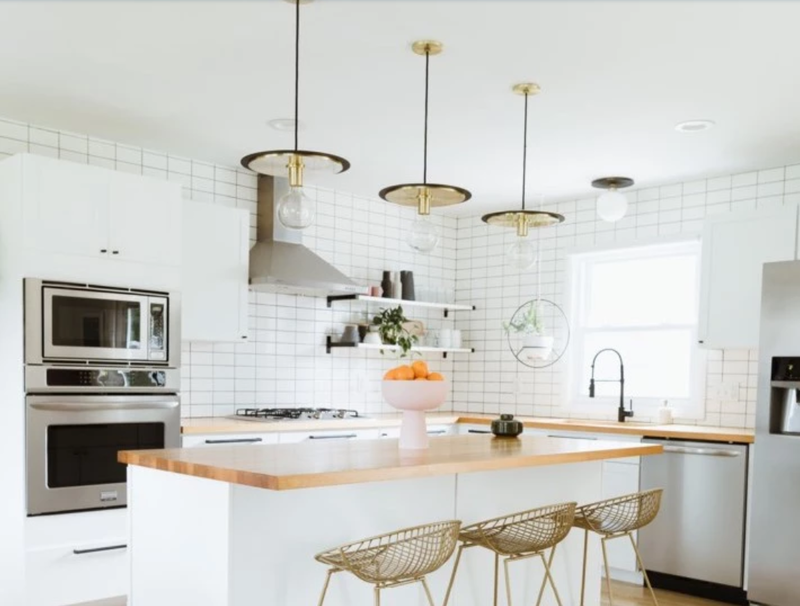 This week, we’re taking a look at kitchen light fixtures and how you can choose the right ones for your space. Choosing a light fixture seems like a no-brainer…until you actually have to do it! 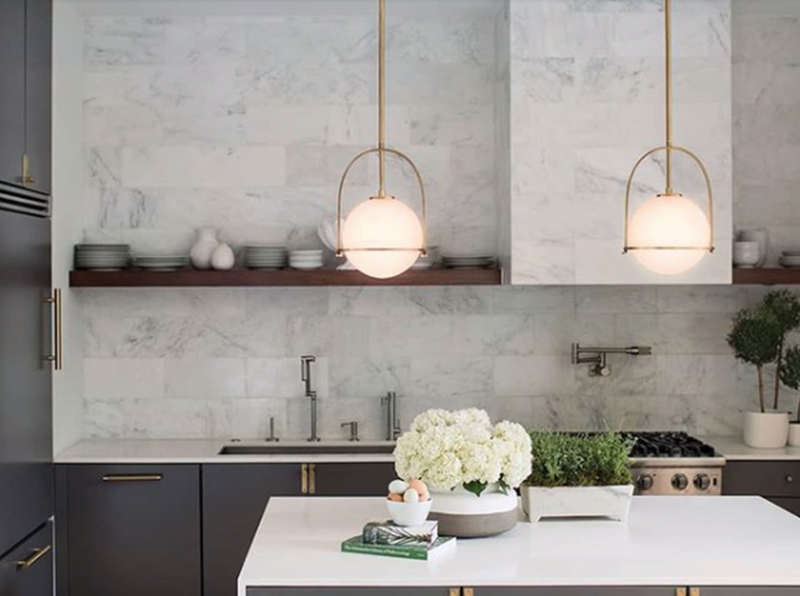 Then you realize there is so much to take into consideration, like the size of the light, where to place them, how low to hang your pendants, etc. etc. 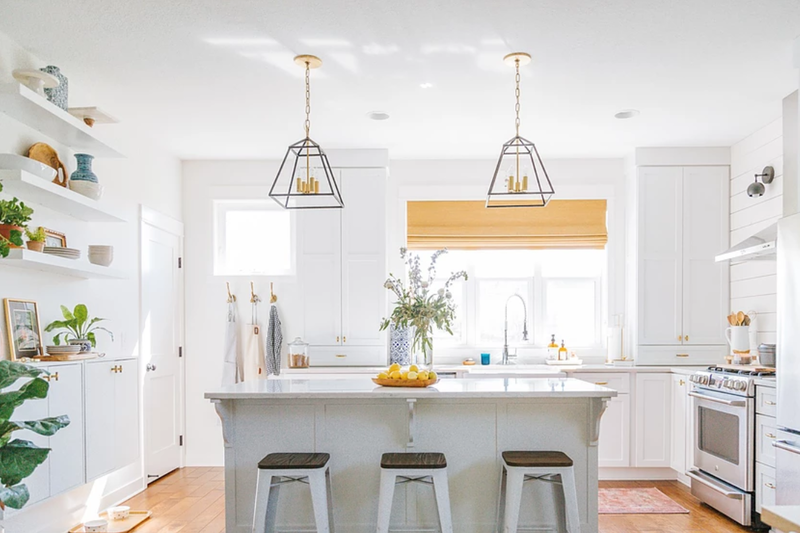 We’re here to help guide you through the process, so keep reading to learn how to choose the perfect light fixture for your kitchen. To shop any of the products we mention in this post, scroll to the bottom for Where to Buy. Although they’re often an after thought in the decorating process, your fixtures have a huge impact on the look of your room. Consider the overall style of your space and then decide what kind of impact you want your fixture to have. 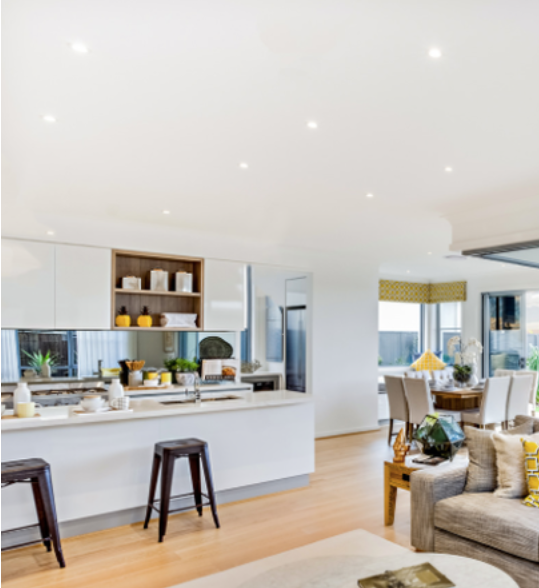 If you have a busy, colourful decor theme, you may want a clean, simple pendant to keep things from feeling overwhelming. Or maybe you’ve gone for a clean minimal space and you want an eye catching fixture to act as a focal point for the room. Want to add a modern twist to an otherwise cozy and rustic kitchen? Consider an industrial style to give you the perfect modern farmhouse feel. Remember that your light isn’t an afterthought but rather an integral part of your design! In all rooms, but kitchens especially, one big light in the middle of the room just isn’t enough. Instead, consider how you can layer your light to match the atmosphere and functionality you want in your space. There are three types of lights you’ll want to include: decorative, accent, and task. Let’s start with the decorative. These are your larger pieces that really add to the decor and are typically hung over the kitchen island and/or table. These are the fun pieces to pick out! Scroll through our blog to get inspiration on fixtures for your space! Next, you’ll want to add in some accent lighting. These are things like pot lights, track lighting, and even lamps around your kitchen that add a dimension to the lighting. DALS Lighting carries an amazing selection of pot lights and linear lights. They’re also coming out with colour and temperature changing pot lights that work just like their Smart Bulbs! We’re really excited for them and will be sharing more soon. Finally, task lighting is the practical lighting that you’ll need, such as under cabinet and pantry lighting. Once you have your decorative lights, you’ll need to figure out how to hang them. Again, this sounds simple in theory but can be challenging when it comes to it. For everything you need to know to perfectly hang your lights, check out our guest post from Halifax-based decorator, Nancy Dibblee. And by details, we mean beautiful wall plates. 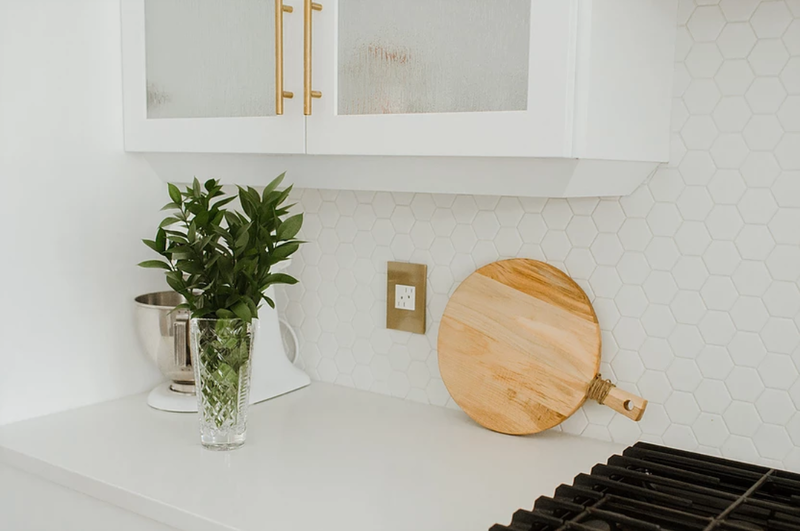 Take your kitchen backsplash from average to insta-worthy with the line of gorgeous designer wall plates from Legrand’s adorne collection. In addition to their stylish plates, you can also get cool features like USB outlets and pop-out outlets.